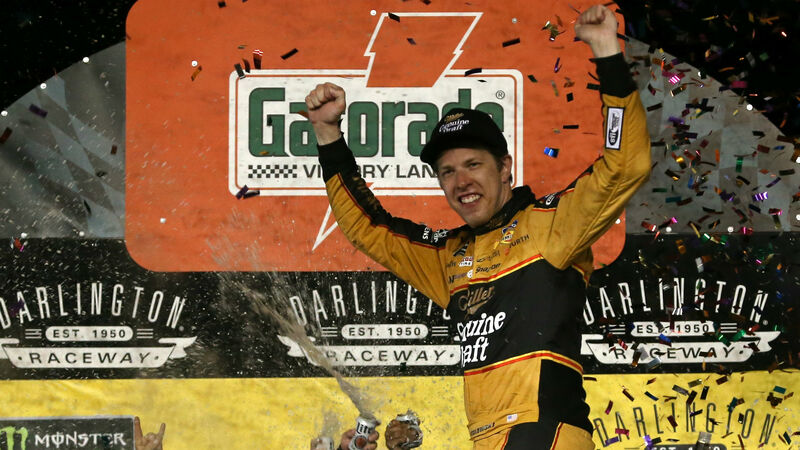 Brad Keselowski proved it’s not how you start, but how you finish after winning the Bojangles’ Southern 500 is at the Darlington Raceway in Darlington, South Carolina. Kyle Larson won the first two stages, which were marked after laps 100 and 200. But by the end of the 367th and final lap, Keselowski claimed victory after being buoyed by an impeccable pit crew that gave him the lead for good on lap 346. Below are highlights and updates from Sunday’s race at Sonoma (All times Eastern). 10:59 — And Keselowski wins it with great work from his pit crew. Larson won the first two stages, but it’s truly about how you finish. 10:46 — Brad Keselowski is the new leader with 22 laps to go after a seamless transition from his pit road back to race track. 10:17 — Clint Bowyer is done for the day after a big crash, but thankfully he appears to be OK.
10:10 — Larson continues to close in on a victory. 9:48 — 100 laps to go. Larson still in the lead. 9:09 — Larson takes stage two in a close finish. We’re now down 200 laps with 167 to go. We’re also done with stages for the night. 8:25 — Joey Gase has crashed after getting hit from behind by Kyle Busch. 8:05 — Larson wins stage one. We’re through 100 laps with 267 to go. 7:20 — Kyle Larson is the lead early on. We’re about 13 or so laps in. 7:00 — Drivers are about to get the all-clear and we’re set to start soon. 6:30 p.m. — We’re in a bit of a weather delay as lightning approaches the area. The race may start at 7 p.m.